Do you want to build a buggy ? If you have never built before, start with something simple to develop your construction skills. 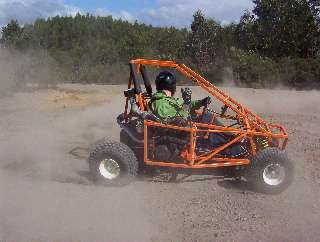 A Funkart3 or Trax2 or possibly a Sidewinder if you feel confident, would be a good start. Plans are available at "the edge" website and while they are not cheap, they provide lots of detail and HOW TO for the home builder. 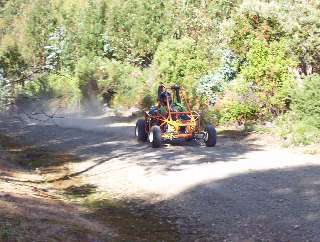 The completed buggy could then be sold to finance another more complicated design. I mainly used a GASLESS (flux core) MIG for the MINI-SIDEWINDER project (first time used) and my welding got better as I went on. For heavier welds I used manual arc. While there is more weld spatter with mig, I found spatter did not adhere to painted surfaces. Good tip is to get a pressure pack of ZINK-IT and apply a thin spray to nearby bare metal before welding. The gasless mig seems to weld ok through the ZINK-IT. Buy a big roll of 0.8 wire as I used about 6 small rolls. It works out cheaper. 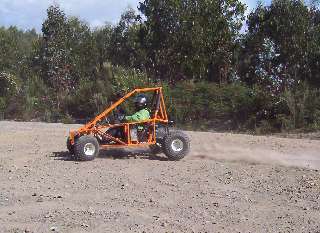 The Funkart or Trax2 is best suited to sandy beaches, grassy farm paddocks, dirt or gravel roads/tracks. 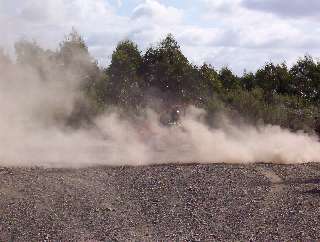 It is usable on rutted tracks but at a much reduced pace. 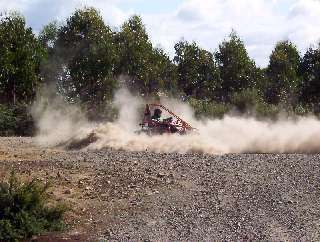 The sidewinder is a fair bit more suited to rougher going but on very rough going would not keep up to a dirt bike once the bike rider has to stand up. 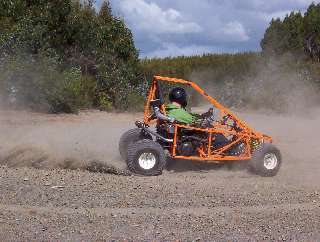 The bigger buggies from the edge using big 4cyl bike engines are more suited to race track or wide open spaces, sand dunes or anywhere you can use the power and speed. They will cost lots more due to the complexity of construction. Get all the major parts before you start (Wheels, tyres, engine, suspension bits, seat) so that you can allow for any variations in dimensions from the original plans. If you use a motorcycle engine, get a 200-250cc 4 stroke for a Trax2 2, or 400-650cc 4 stroke for the sidewinder. (single cylinder in both cases). Only use a 2 stroke as a last resort. Apparently they vibrate badly. Use Stainless steel bolts and nyloc nuts for everything. Except where HI-TENSILE bolts are specified, like steering connections, bolts through shocker eyes, etc. Allen head type bolts are high tensile, minimum grade 9 I think. I found my Trax2 was fairly cozy fit ( I am 5' 10") and my helmet did hit the overhead bar padding every now and then, although I did have a slightly padded seat. Extend the frame a couple of inches (50 mm) higher. Also lengthen the frame rearwards about 8 inches (200 mm) for a couple of inches extra leg room, to make more room for motorcycle engine, and move the rear axle rearwards as much as possible to improve weight balance for steering. For best performance I would recommend gearing of the Trax2 to no more than 80kph. Less with a smaller engine. However that will depend on where and who you want to drive it. I also use insulation tape to wrap exposed parts of the back axle . This will help prevent rust and damage from stones, etc, making brake & sprocket bosses and bearings easier to remove. Also wrap tape over grub screws. If they come loose they will not get lost down the road and can be re-tightened. Cut the waste ends of cable ties flush with a sharp knife rather than pliers or diagonal cutters, this will save lots of nasty cuts on your hands and arms during maintenance. That covers most things - my e-mail address is on home page.